Cast Iron Effect Guttering combines a traditional appearance with all the benefits of modern manufacturing, including a 20 year colour guarantee. For further information please read more below and watch the video where you can see close up views of many of the products. Cast Iron Effect Gutters are available in Half Round, Ogee and Deepflow styles with a choice of round or square downpipes. A number of smaller guttering suppliers have started to buy in plain gutter products and paint the Cast Iron Effect on themselves. Whilst the initial appearance may be the same, and indeed these suppliers may well use genuine images of Cast Iron Effect products on their websites, the end product is inferior. FloPlast's paint formulation and spraying and baking process has been perfected over a number of years through extensive accelerated weather and impact testing - this is why Gutter Supplies offer a 20 year guarantee on this range. Inferior paint finishes applied after the product has left the manufacturers' premises will definitely not stand the test of time and the manufacturer's guarantee will be invalidated. Click here for a close up view of the FloPlast Cast Iron Effect Gutter System. Plastic guttering manufacturers, aware of the business that was being lost to traditional manufacturers, have in recent years come up with a clever alternative. 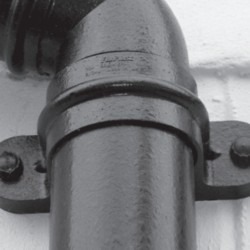 Cast Iron Effect Gutter and Soil Pipe systems incorporate the appearance of traditional cast systems into a modern PVC product, meaning that all the benefits of plastic are still inherent in the product. It looks like metal, it even feels a little like metal, but it is lightweight, easy to install and it won’t rust or need painting. The method of fixing this system is exactly the same as normal guttering, so it can be undertaken by any builder, plumber or competent DIY-er. Whilst the market for guttering supplies is undoubtedly a vast one, it had seen very little change since the early 1980’s, with proven technologies delivering a wide range of good quality PVC and Metal gutter systems. Generally speaking, if you wanted a traditional appearance you chose Cast Iron Gutters and if you liked the modern benefits of plastic you chose a PVC system. However in the last ten years, the introduction of Cast Iron Effect Gutters has turned this notion on its head. Manufactured using a closely guarded two-stage process, this type of guttering offers developers and householders all the well publicised benefits of maintenance free plastic, but with the timeless appearance of traditional painted iron. Available in Half Round, Deep Flow and Ogee styles, with a choice of round and square downpipes, there is a design to suit all types of properties old and new. With a range of decorative hoppers and motifs to complement any of these systems you can turn what was once a functional piece of plumbing into an eye-catching feature. For your peace of mind each system is protected by a 20 year colour and performance guarantee. 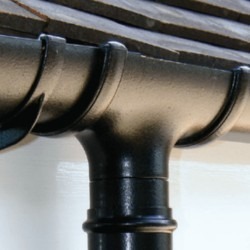 Discover more about the features and benefits of cast iron effect guttering here. Installation is the same for cast iron effect as for all other PVC Gutters. You will find whole host of information about gutter installation on our Guides and Tips Section here, including detailed Installation videos. For those perfectionists who want perfect harmony there is even a matching cast iron effect soil pipe system! Please visit our Cast Iron Effect Gutters Guides & Tips section for more product reviews and comparisons, videos and PDF instructions.